This morning on board the Aurora, we travelled out to the northwest corner of Stellwagen Bank! There was lots of activity out there today! 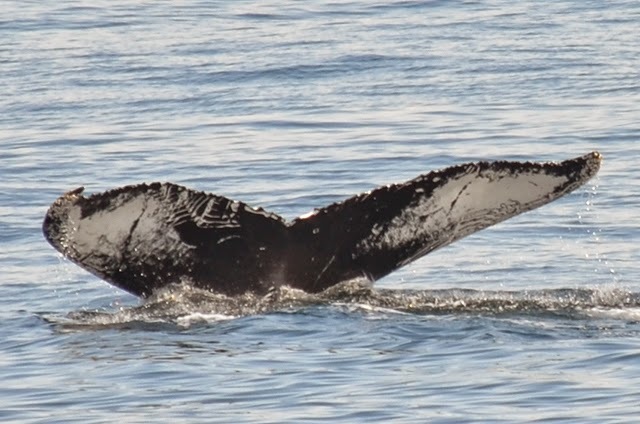 Throughout the trip, we got great looks at three pairs of adult humpbacks! The pairs included Alphorn and Music (both new sightings for this season), Scratch and Conflux and, of course Northstar and Hippocampus! It was great to see some new whales in the area! Throughout the trip, all the activity was concentrated within one square mile. The most exciting part of the trip was one of our last looks. Since the water was so calm, it was easy for us to spot every disturbance on the water so we saw the full extent of Northstar’s awesome bubble spiral ring right next to our boat! It was a great look, and everyone was so excited to see Northstar and Hippocampus coming up to the surface. It was a beautiful morning with plenty of whales! Today we headed out to the northwest corner in beautiful weather conditions. Light winds and calm seas made for a beautiful opportunity to see a variety of marine life. On the corner we quickly spotted a pair of humpback whales. Northstar and Hippocampus—what are the chances?! These two whales were engaged in some great bubble feeding activity however the animals were feeding below the surface and only surfacing in order to get a few breaths of air before their next foraging foray! We had spotted a few more blows on our way into the area so were very happy to have a pair of humpbacks, Scratch and Conflux, cross our bow and join very briefly with Northstar and Hippocampus. Northstar headed off with the new pair and Hippocampus trailed behind. But never fear on the next surfacing Northstar and Hippocampus were once again back together. 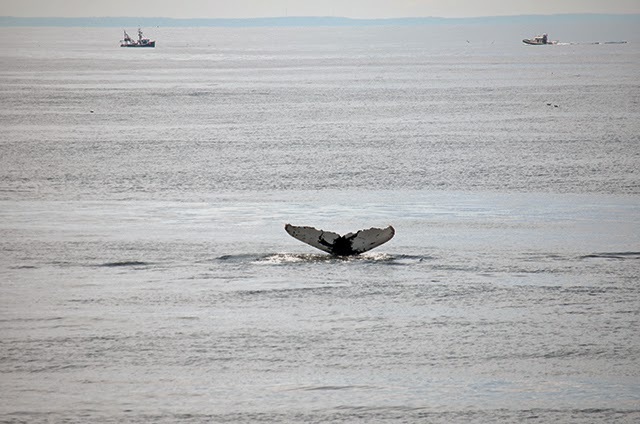 We also spotted another pair of humpbacks, bringing out total to 6 animals, a little ways off and were able to identify them as Alphorn and Music! 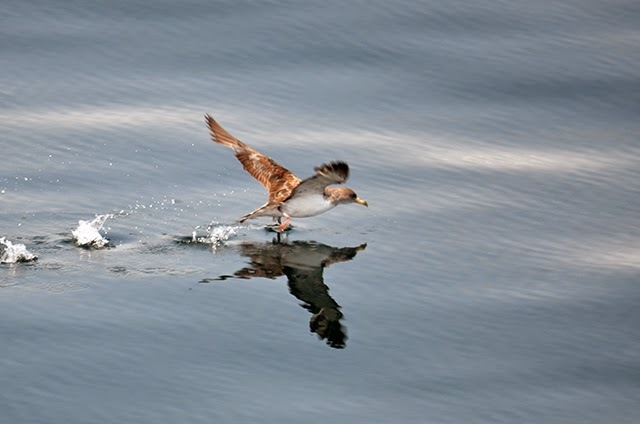 The birds were out in force and we saw gulls, shearwaters, juvenile gannets, and even a swallow all the way out to sea. It was as ever, a beautiful day on Stellwagen Bank. Today on board the Aurora for the 1:30 whale watch, we traveled to the northwest corner of Stellwagen Bank like our earlier trips had. 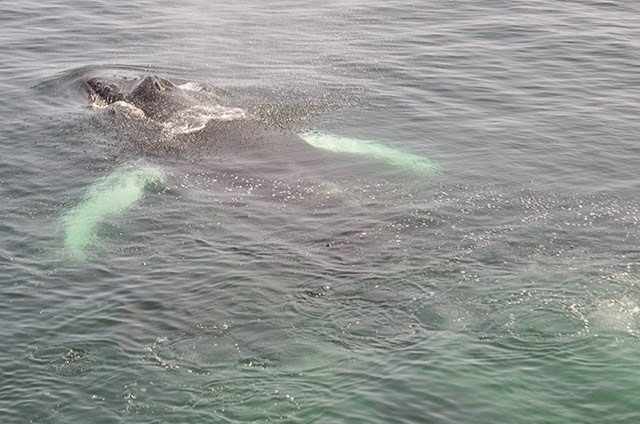 Once there we found four scattered humpback whales. First we saw Alphorn traveling alone, but then quickly spotted Northstar and Hippocampus close by. The pair of Northstar and Hippocampus joined and split from Alphorn on multiple occasions. The group even surfaced in unison after we saw a large bubble cloud formed under the surface. Alphorn, as well as Northstar, has some large scars from past injuries. 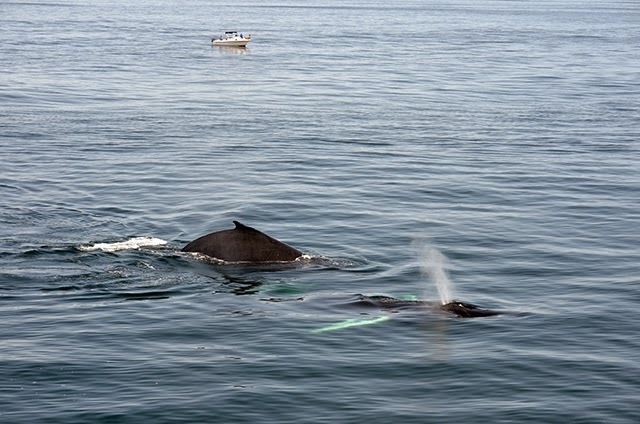 See attached photos of Alphorn’s left dorsal fin, fluke, and it swimming with Northstar. 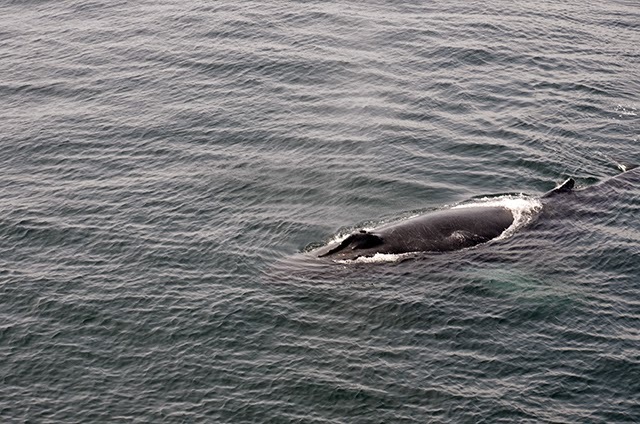 We also spotted another humpback about 1 mile away that turned out to be Music. All of the whales that were in the area were taking short dives, averaging about 3-6 minutes, as well as doing some high fluking dives.